Khutzeymateen Provincial Park is one of British Columbia's premier, virtually untouched, wildlife preservation areas. Located near the B.C. - Alaska border just north of Prince Rupert, it occupies an area of 44,300 hectares at the northern most edge of what has become known as the Great Bear Rainforest. The park was established as a sanctuary for grizzlies in 1994 with the help of conservationists and none other than the Duke of Edinburgh. Accessible by float plane from Prince Rupert, only a couple hundred visitors are permitted to visit the sanctuary each year. Only two vessels are allowed to dock in the Inlet, the Ocean Light II and Sunchaser. Both take clients out into the estuaries to view bears in inflatable boats (called zodiacs). I chose the Sunchaser, captained By Dan Wakeman (and it wont be the only time). It rains a lot in British Columbia's northern coastal forests. During my Khutzeymateen experience, it rained every day and night. When you're living on a sailboat and going out to view bears in an uncovered zodiac, you're gonna get wet even when isn't raining. Probably the most important advice I can give for visiting a climate like this is to have warm, water-proof clothing - not "water-resistant" or "water-repellent." Those aren't sufficient and tend to soak through after a few hours in the rain (and it is very difficult to dry out your stuff on a sailboat). You want solid rubber and full coverage from head to toe. Imagine the stuff that lobster fisherman wear...that bright yellow rubber rain jacket and pants...that's what you want. Several outdoor clothing companies make rain gear of this caliber; I'd recommend something from Helly Hansen or similar, or you'll be stuck with the guide's bulky rain suits, which are difficult to shoot in. Make sure your boots are waterproof as well! The best investment I made in preparation for the Khutzeymateen was the cheapest purchase made for the trip. I paid $7 for a pack of two plastic rain covers with drawstrings for my cameras. They worked perfectly. Even though my clothing was damp by the second day of shooting in the rain, my camera gear was completely dry! A couple other guys in the boat had much more expensive nylon rain covers, but I noticed them constantly adjusting them, and they didn't seem to cover their lenses completely. My cheap plastic covers protected my camera and 200-500mm lens from hood to viewfinder. I only got a couple droplets on the LCD at times. One of the other photographers actually had water and condensation get inside his lens and camera body while using one of the more expensive covers. I had no issues with moisture. I also packed several absorbent microfibre cleaning cloths, but rarely used them. A waterproof camera backpack, or a good rain cover, is also essential to store other gear or a backup camera in. The bottom of the inflatable boat will be very damp, so a rain cover is necessary. I used a detachable cover so that I could hang it out to drip dry between outings. A grizzly looks across the rainy inlet in the direction of the Sunchaser, Khutzeymateen Provincial Park, British Columbia. You may be tempted to bring a 500mm f4 or 400mm f2.8 or some other gargantuan piece of glass to the Khutzeymateen. You don't need it. 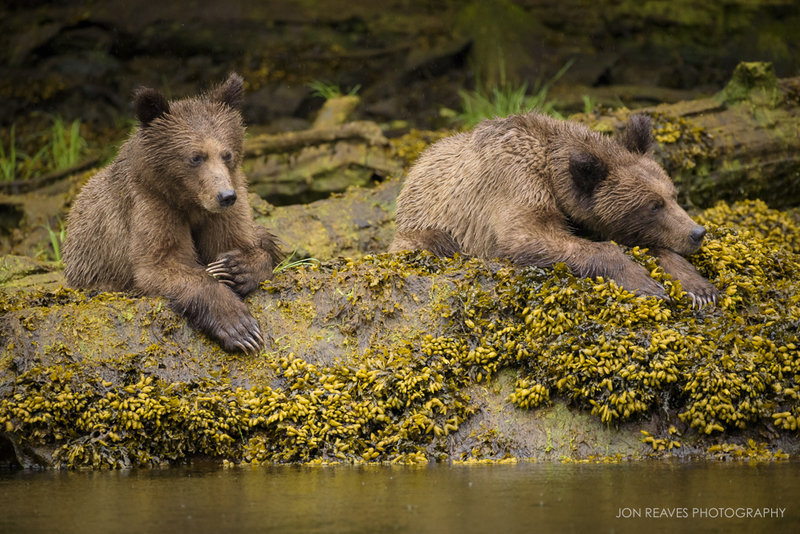 You'll be close enough to photograph bears with a 70-200mm for the most part. I used my Nikon 200-500mm VR 90% of the time. In fact, each of the four of us used lenses in that range. One guy had a Tamron 150-600, another used a Canon 100-400 IS, and both me and the other photographer were using the Nikon 200-500mm. We all got great images. These lenses are not only light and easy to pack and hand-hold, they provide lots of versatility in focal length. This allows for creating a variety of compositions instead of being bound to just 400 or 500mm. 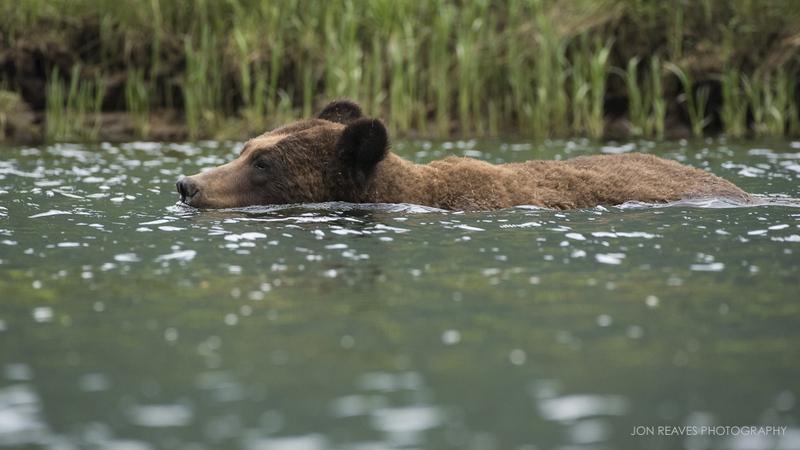 The boat can't always shift around to give photographers a better view (the bears well-being and safety come first), so versatility is essential. You also can't use a tripod in the zodiac, and even use of a monopod makes shooting awkward (and is annoying for others in the boat). So, use of heavy prime telephotos is not recommended. Make sure your lens has vibration reduction (or equivalent). The zodiac is moving a bit even when the engine isn't running, which makes getting sharp shots a bit of a challenge. The biggest challenge in photographing wild grizzlies was getting sharp and well-exposed images. As earlier mentioned, the boat is constantly moving, but so are the bears. Proper hand-holding technique with longer lenses is crucial and vibration reduction helps as well, but a fast shutter-speed is also needed to freeze the bears. They're not moving fast, usually just lumbering around eating sedges. Combine their constant movement with the constant movement/vibration of the boat, and the fact that it'll probably be dark overcast, and you've got the perfect recipe for blurry images. The faster the shutter-speed, the sharper the image. Of course that comes at a cost. High ISOs (which degrade image quality especially with crop-sensor cameras) are needed to get shutter-speeds fast enough to freeze motion. I shot in Manual mode with auto-ISO turned on while using a full-frame DSLR (allowing ISO to fluctuate between 400 - 4000 depending on the shutter-speed and aperture I selected manually). Full-frame cameras do a much better job at producing clean (less-noisy) images at high ISOs compared to crop-sensor models. Most of my images from the Khutzeymateen were shot between ISO 1250 and ISO 3200. Many of my favorite shots were captured at ISO 2500. This allowed me to get shutter-speeds of at least 1/500th of a second. My ideal shutter-speed was 1/1000th or faster, but that was not always possible. To help achieve the fast shutter-speeds necessary and not boost my ISO even higher, I shot at relatively wide apertures in the f5.6 - f7.1 range (my Nikon 200-500 VR is f5.6 at its widest). 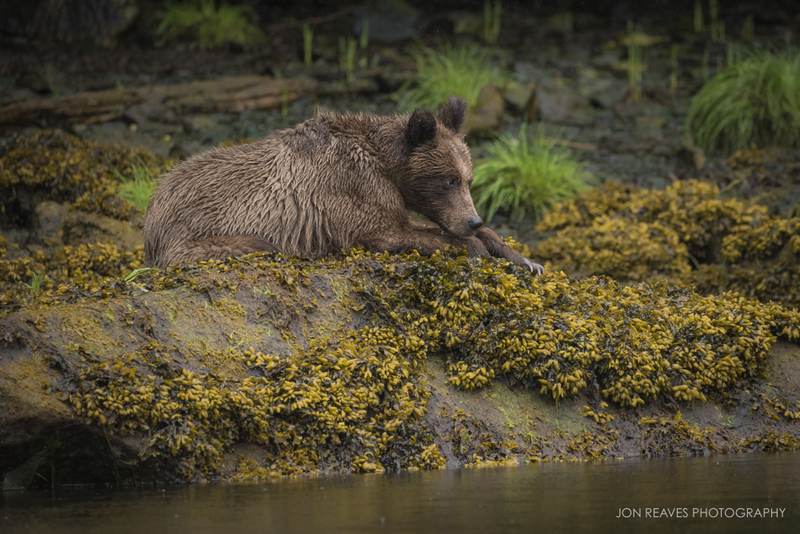 A young grizzly rests on the banks of the Khutzeymateen Inlet at low tide, British Columbia. I am happy with my first experience in the Khutzeymateen, as well as with Sunchaser Grizzly Tours. The other three photographers on the trip, who I had never met previously, were great to shoot with. We cooperated with each other in the small zodiac to make sure we all had clear views of the bears. There were no big egos. We had a great time and came away with great images despite the tricky conditions. Captain Dan and his assistant made sure that we had a 5-star bear viewing experience while respecting the environment and coming away with a better understanding of grizzlies and their habitat. I'd recommend this trip to any nature photographer. Thanks for reading and safe travels. For my full travel/nature photography packing list, click here. I not only brought home 2,294 images of British Columbia's wild rainforest grizzlies, I also brought home one of the worst colds I've ever had. The last few days have been spent sleeping, sneezing, coughing, and staring at the walls. I've barely begun to dive into the bear photos. I've also barely started preparing for my next trip, which is to begin in only two days! The Khutzeymateen is an amazingly beautiful patch of wilderness near Prince Rupert, BC. The inlet cuts through dense old growth forest just on the B.C. side near the Alaska border. It is the most northern area of what has become known as the Great Bear Rainforest. And rain it does. We had four full days of rain. My so called "waterproof" clothing soaked through, and I had to borrow rubber rain gear from the guide. The $7 (for a pack of two) rain covers I bought for my cameras worked great, however. My gear actually fared much better in the soggy weather than I did. 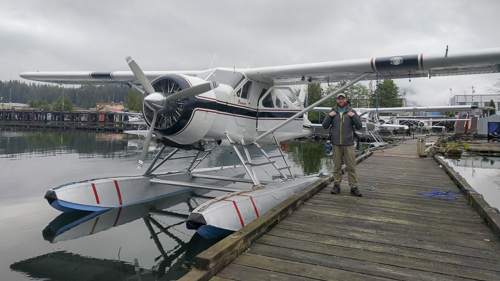 Preparing to board a float plane for a 20 minute flight to the remote Khutzeymateen Inlet. The views of coastal British Columbia from the plane were stunning to say the least. Prince Rupert, BC. Each day was spent searching the inlet and estuaries for grizzlies in an inflatable boat that held 5 people. Our base was a sailboat anchored in the inlet. Only two vessels are allowed to anchor in the inlet and lead multi-day tours into the estuary. I chose SunChaser, led by Captain Dan Wakeman. Dan was instrumental in the creation of the Khutzeymateen as a sanctuary for grizzlies. He is extremely knowledgable about the bears and passionate about conservation. He has been leading tours into the area for 30 years. He is aided by talented and knowledgable conservation photographer Steve Williamson, who was also our inflatable boat driver. Despite less than favorable shooting conditions (it's really freakin' hard shooting from a moving zodiac with a 500mm lens! ), we had great encounters with bears every day. Dan and Steve knew each bear, their life story, and their temperament. I appreciated that Dan and Steve put the well being of the bears first. The bears mostly went about their business. If a bear changed its behavior at the sight of our boat, we'd simply move on to another bear that was not bothered by our presence. It was a great privilege to get to spend time with wild bears in such a pristine environment (from the relative safety of a boat). What's in my camera bag? Click here to find out!